Wolstanton had a workhouse at the north-east end of the Marsh. 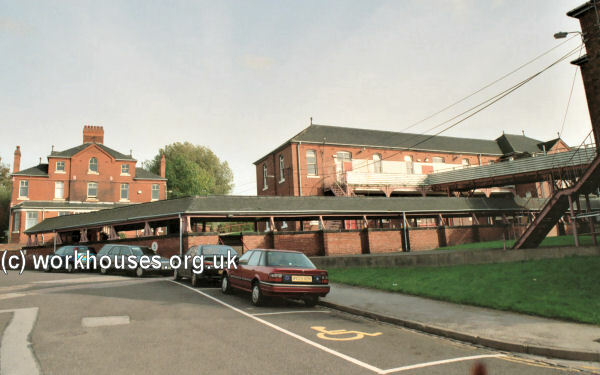 Burslem's workhouse at Greenhead dated from the 1780s and was greatly enlarged in 1835. Inmates were provided with work at local manufacturies, with the bulk of the earnings from such work going to the parish. Being very satisfied with the existing arrangement, the two parishes were initially resistant to form a union under the 1834 Poor Law Amendment Act. Assistant Poor Law Commissioner Richard Hall, in a report on the area in 1836, found a catalogue of malpractice in existing poor law administration which was mainly in the hands of local manufacturers. Hall found, for example, that threats of industrial action from an already substantially unionized workforce had led to the provision of out-relief to those in dispute with their employers. However, the Poor Law Commissioners eventually held sway and the new Wolstanton and Burslem Poor Law Union formally came into existence on the 2nd April 1838. The combined population of the Union at the 1831 census had been 23,567 and in the years 1835-7 the total expenditure on poor relief had been a relatively modest £6,210 or 5s.3d per head of the population. 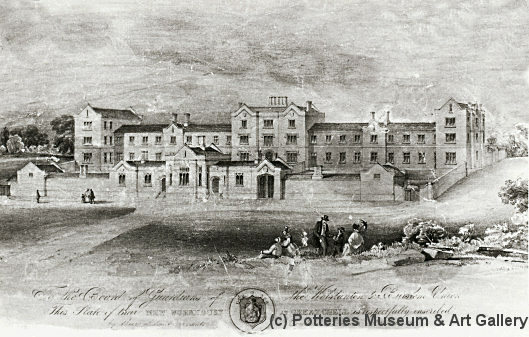 Wolstanton and Burslem workhouse from the south-west, c.1840. © Potteries Museum and Art Gallery. The buildings comprised three main sections. A single-storey entrance range contained the porter's lodge, board-room, offices, and receiving wards, possibly with vagrants' wards to the side. The three-storey main block had quarters for the master, matron, schoolmaster and schoolmistress at the centre, with male accommodation in the north wing and female in the south. An infirmary was at the rear, together with the laundry on the female side, and the bakehouse, cornmill, workrooms and piggeries on the male side. A kitchen, with chapel above, lay between the main block and the infirmary. Wolstanton and Burslem main building from the west. In around 1880, an area of land to the west of Turnhurst Road became a burial ground for the workhouse. 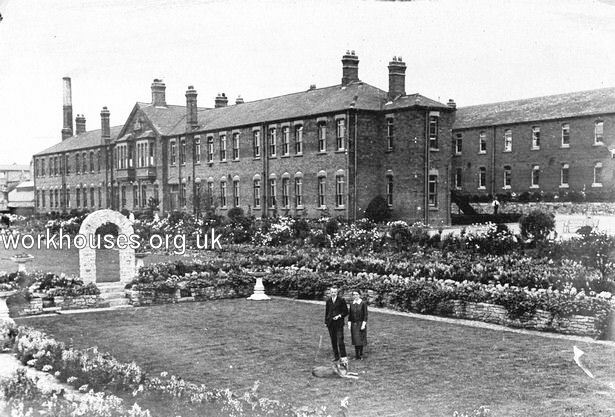 Wolstanton and Burslem workhouse site, 1922. A flavour of life in the Chell workhouse in its early years is provided by Charles Shaw in his book When I was A Child published anonymously in 1903. Sixty years earlier, ten-year-old Shaw and his family were forced to spend a few weeks in the workhouse when his father lost his job after participating in a strike. I had heard of workhouse skilly but had never before seen it. I had had poor food before this, but never any so offensively poor as this. By what rare culinary-making nausea and bottomless fatuousness it could be made so sickening I never could make out. Simple meal and water, however small the amount of meal, honestly boiled, would be palatable. But this decoction of meal and water and mustiness and fustiness was most revolting to any healthy taste. It might have been boiled in old clothes, which had been worn on sweating bodies for three-score years and ten. That workhouse skilly was the vilest compound I ever tasted. Shaw also graphically describes how a boy who had run away from the workhouse was brought back and publicly flogged with a pickled birch rod until he was barely conscious. You can read longer extract of Shaw's book and also part of Arnold Bennett's novel Clayhanger which made use of incidents described by Shaw. In 1922, the Wolstanton and Burslem Union and Stoke-upon-Trent Unions merged to create a new Stoke and Wolstanton Poor Law Union. 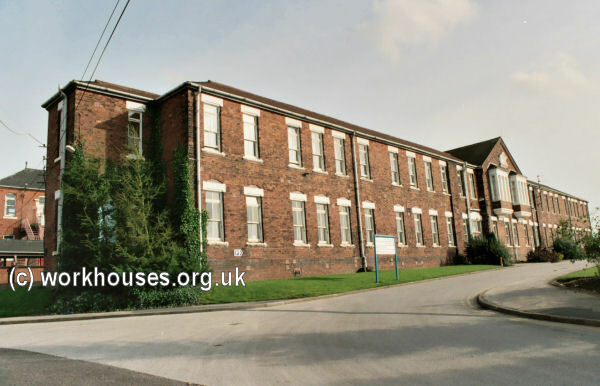 After 1930, the workhouse buildings were take over by Stoke Corporation and subsequently became the Westcliffe Institution, then the Westcliffe Home for the Aged and Infirm, then part of the Westcliffe Hospital. 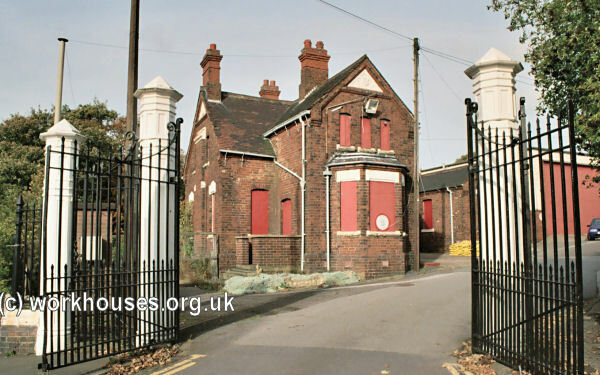 The main workhouse buildings have now been demolished but the infirmary blocks at the south of the site are still (2001) in use. By 1912, the Wolstanton and Burslem Union had established children's scattered homes at: 55 Macclesfield Street, Burslem (Boys); 152 High Lane, Burslem (Girls); Victoria Road, Tunstall (Girls); and 2 Stanley Street, Tunstall. Stoke on Trent City Archives, Hanley Library, Bethesda Street, Hanley, Stoke on Trent ST1 3RS. Holdings include: Guardians' minute books (1854-58, 1901-3, 1914-16, 1919-22); Various lists of births, baptisms and deaths (1840-1940s); etc.